At both Five Oaks Ranch and Barrett Tree Farm, there is an ongoing, serious commitment to preserving and improving the environment. Cattle at Five Oaks ranch are grown on natural pastures in a program that utilizes intensive-grazing cells and improved pastures. With participation in the EQIP program of the USDA, pastures are being re-seeded to provide an improved grazing environment for the purebred Santa Gertrudis cattle herds. A portion of the property, located in the Brazos River Bottom, is maintained for the wildlife that roams the acreage; and pecans are often harvested from the 400-tree organic pecan orchard. 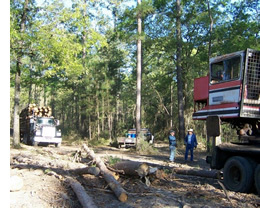 On the Barrett Tree Farm located in northern Walker County, Texas, the 1300+ acres devoted to pine production is managed as a Tree Farm under the auspices of the Texas Forestry Association (TFA). Both Bill and Kati Barrett have served on the Tree Farm Committee of TFA since the year 2000. The forest stewardship program at Barrett Tree Farm includes streamside management areas that are designated and maintained for the benefit of wildlife and water fowl. Prescribed burning is also used to control excess undergrowth in the pine forest so trees can better utilize the sunlight and moisture; and the wildlife can thrive on the tender, young vegetation that returns after a burn. An additional benefit of the controlled burning is to remove combustible fuels close to the ground in the event of wildfire. In 2002, the Barretts were recognized for their forestry stewardship and environmental management when they were selected as Forestry Conservationists of the Year by Region IV Texas Soil and Water Conservation District.